With the next round of Food Safety Modernization Act (FSMA) updated regulations taking into effect September, food processing companies are scurrying to make sure their facilities are up to code. The newest set of updates will support efforts into the quick responses to food/beverage related emergencies (contamination, expired products, recalls, and foreign materials). The new amendments also require that the FDA inspect the food production facility every two years to make sure that the facility and products adhere to all regulations. A simple first step into maintaining food processing safety is x-ray/inspection equipment for product safety and making sure the machines operate properly. In making sure these machines operate properly, one has to make sure that they have the proper thermal management equipment; something in which Pfannenberg has extensive experience in. Pfannenberg worked directly with a food and beverage inspection OEM to provide complete engineering solutions for the cooling of x-ray tubes and the internal cavity of their inspection machines. These machines would end up in various food & beverage and pharmaceutical end use facilities. Before meeting with Pfannenberg our customer used several different competing thermal management products; conventional cabinet air conditioners to cool the machine cavity, two small internal fans to move the air around and a small chiller. It was costly, cumbersome while leading to additional maintenance costs and condensate issues. The Pfanneberg team came up with a solution to utilize a CC Chiller in conjunction with a small PWS Air to Water Heat Exchanger to cool the x-ray tubes and internal cavity. By combining products and eliminating an air conditioning unit, the Pfannenberg option required less maintenance and was more cost effective eliminating dependencies on different competing products. To read, "The Technology of Cooling Part 4: Closed Loop Liquid Cooling Solutions". 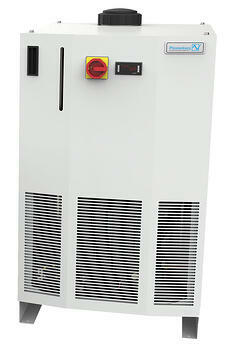 Click here to learn more about Pfannenberg's CC series chillers.